Okay, I admit it. When I doing my conditioning rides and walking on the trails, I catch up on my business calls. Okay, ‘fess up. How many of you talk on the phone when you’re riding your horse? I admit it. I catch up on my calls when I’m hacking out. I don’t talk on the phone when I’m schooling, but with my head phones plugged in and my phone safely in my arm band, I think it’s a hoot to make business calls from the back of my horse. Shhh. I’ve only told a few people that I do this. Some of my long time clients have probably figured it out. The wind whistling in the background. The sound of hoof beats on the inconveniently located paved road. The errant whinny. At least one of them thinks it’s pretty funny, but the rest will stay in the dark. On days when I’m pressed for time — and I’ve had a lot of them lately — I’m loathe to give up a ride on a beautiful spring day so that I can sit inside and talk on the phone. So, why not? The potential problem is that I could fall off. It almost happened once. Several years ago I was cooling Freedom out on a loose rein, walking in the field at the barn. He was chill. I was chill. Then, out of the blue, a jogger ran by us, stopped and a hand stand up against a tree. Freedom practically dropped his teeth. What on earth was that woman doing upside down? Frankly, I was amazed that he noticed. It wasn’t the jogging part that worried him; it was the upside down part. 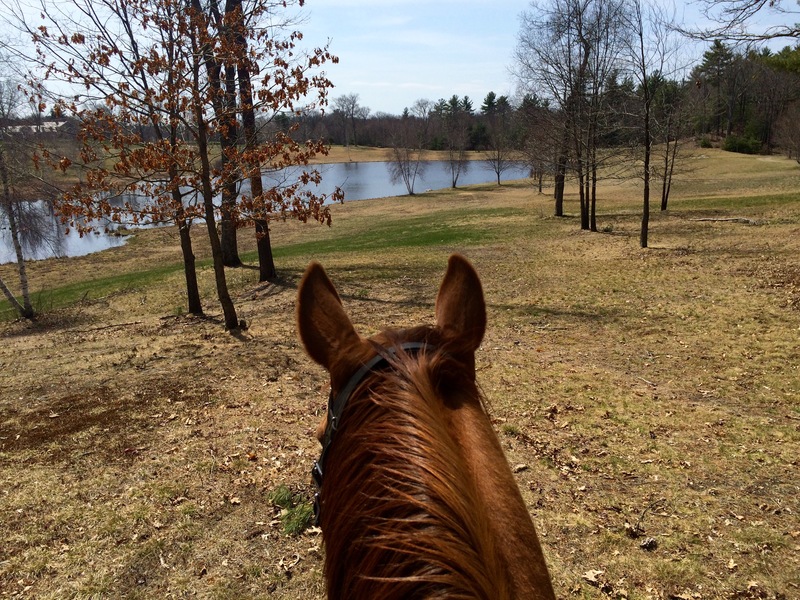 We immediately flew four feet to the right and it was only sheer luck that kept me in the saddle. Funny! I can just picture the handstand and Freedom’s expression.